We came this close to watching Marcus Fenix punch a farting bear in the snout. Weird headline, right? Is it any weirder to hear that it almost happened? Apparently, Street Fighter X Tekken producer Yoshinori Ono's original plan for the game would have seen the title feature big-name exclusive fighters in each of its various iterations. The Sony versions have them. The firm's feline mascots, Toro and Kuro, appear in the PlayStation 3 and Vita versions of the game, alongside the wildly generic, superhuman protagonist from Sucker Punch Productions' inFamous series. Yet the Xbox 360 version of the game strictly features fighters from Capcom and Namco Bandai. Why? Because Microsoft and Capcom couldn't come to a timely agreement on who should make a special cameo appearance. "We do have the exclusive characters for the Sony platform. We have Cole, the two Sony cats, Kuro and Toro. But basically for the Xbox 360, we were in discussions with [Microsoft] for which character to put in as an exclusive, but we weren't able to decide on a character because of differences in timing and things like that," Ono told Xbox360Achievements.com. "So unfortunately for Street Fighter X Tekken, only the PlayStation family will be getting the exclusive characters, but it's something we wish could have happened. It's just too bad, basically." When asked which characters the Xbox 360 iteration might have featured, Ono name-dropped some of the biggest characters of recent years. "In terms of characters we wish we could have put in the game, Master Chief or Marcus Fenix from Gears of War would have been really cool, but it was just really difficult," Ono said. Would Master Chief or Fenix have been a silly gimmick? Most likely, but let's be honest, in a game like this, that blatantly refuses to take itself seriously, they could have worked. 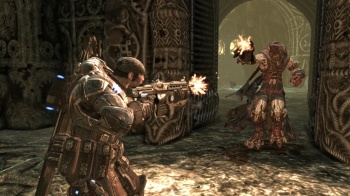 If nothing else, those two may have served to entice a lot of Xbox 360 fans to pick up a title they might otherwise ignore in favor of the latest first-person shooter. Sad news for those of us who enjoy beating the stuffing out of newbies to inflate our fragile egos, huh?